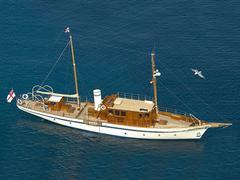 Louisa Bowman in the London office of Edmiston & Company tells me that the 28.04m classic yacht Ilona of Kylesku has been sold in an in-house deal. Originally built as Mauna Loa by James Armour & Sons in 1907, she was purchased in 2001 by the Duke of Westminster who undertook a massive restoration project at Southampton Yacht Services. She has proved herself a decent cruising yacht having travelled between the Mediterranean and Scotland under her current ownership, and was reputedly involved in the Dunkirk evacuation in World War II, adding to the colourful history of this 100 year old yacht. Sleeping five guests in three cabins, Ilona of Kylesku was asking £1.4 million.